We are committed to providing specialized childcare for our youngest ones, utilizing well-trained, screened professional childcare providers and church volunteers. Parents can feel confident knowing their children are in a safe place, where they are loved and welcomed. Childcare for infants and children age two and younger is provided in Room 09 (Lower Level) during our Sunday morning worship services throughout the year. 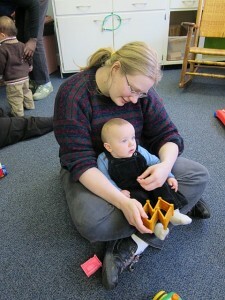 We also offer a Church School class for two-year-olds. See the Church School page for details. Children are always welcome in our services of worship. If needed, reserved seats are available in the Narthex for parents with infants and toddlers. From the Narthex you may enjoy some privacy while still participating in the service.